Increase in urban population, rise in disposable income, and rising working population in emerging economies are contributing to the changing lifestyle of individuals. This changing lifestyle has continuously encouraged users to look for convenient home and kitchen appliances which complements their living standards. Smart ovens provide safety, convenience, timely alerts, reduction in waste, and runs on remote access which helps consumers to operate it from any location. Improved living standards have significantly contributed to the growth of the smart oven market. The market is expected to see a healthy growth rate during the forecast period. The multiple function type of the global smart oven market is expected to hold the major market share during the forecast period and is estimated to bring in revenues of nearly US$403.1 Mn by the end of 2026.Multiple function smart ovens, on account of their wide usage in residential application and due to multiple features offered such as grilling and convection constituted 68.4% share in 2017. Multiple function segment is expected to expand at a good growth rate during the forecast period on account of rising urbanization. This is also estimated to create an incremental opportunity to the smart oven market due to changing lifestyle and need for trendy kitchen designs. Increasing preference for trendy kitchen appliances across the globe directly benefits the smart oven market. Wide acceptance of built-in smart ovens in residential as well as commercial applications is expected to augment the demand for smart ovens during the forecast period. Demand for Wi-Fi connectivity in smart ovens has gone up in recent years due to growth of IoT and increased use of Wi-Fi/Bluetooth connectivity in home appliances and in order to meet the needs of a growing population. This is expected to complement the demand for smart ovens during the forecast period. The reason for the growth of the smart oven market with capacity of 20-25 liters is that end-users prefer larger capacity ovens if the same is available by spending a little more. Furthermore, rising investments in the residential construction sector across the globe directly benefits the smart oven market. Growth of IoT and increased use of Wi-Fi/Bluetooth connectivity in kitchen appliances is expected to augment the demand for smart ovens during the forecast period. In terms of distribution channel, the online segment is expected to expand at the highest CAGR during the forecast period due to rapid urbanization, technological advancements, and convenience. This is also estimated to create an incremental opportunity to the smart oven market due to convenience of online distribution. North America and Europe are the most advanced regions in terms of technology usage, infrastructure, and urbanization. Hence, these regions have emerged as attractive destinations for manufacturers of smart oven with advanced connectivity and more cooking options as compared to Asia Pacific and Middle East regions. The market in Europe is expected to grow at the highest growth rate during the forecast period due to continuous growth in residential construction and customer preference toward trendy kitchen designs and advanced products in the kitchen. The market share of smart ovens in North America was 35.4% in 2017 followed by Europe. Manufacturers are focusing on achieving long-term growth through innovations in the smart oven market. Some of the major players are GE Appliances, Breville Group Limited, Electrolux, SAMSUNG, Candy Hoover Group S.r.l., BSH Home Appliances Corporation, Dacor, Inc., Haier Inc., LG Electronics, Tovala, and Sub-Zero Group, Inc. Various types of smart ovens available in the market have advanced technology with innovative features due to the presence of multiple manufacturers in the market. Thus, customers have an option to choose from a variety of products. This is likely to result in high bargaining power of buyers during the forecast period. This report on the global smart oven market provides analysis for the period 2016–2026, wherein 2017 is the base year and the period from 2018 to 2026is the forecast period. Data for 2016has been included as historical information. The report covers market dynamics including drivers, restraints, opportunities, and trends expected to influence the growth of the smart oven market during the said period. The study provides a comprehensive analysis on market growth throughout the above forecast period in terms of value estimates (US$ Mn) and volume shipments (Thousand units), across different geographies. Technology in the kitchen has evolved as a savior for the new generation. Interoperation of appliances is the next big thing. Smart kitchen is a result of this interoperation. Smart oven or the kitchen of the future helps to make smarter decisions when it comes to daily cooking. The emergence of smart homes is aiding the growth of smart appliances like smart ovens which can be connected to an individual’s smart phone and monitored remotely. With advances in technology, the smart oven market is expected to undergo significant developments, thereby influencing consumers purchase intentions. One of the major features of a smart oven is that it can be remotely controlled by Wi-Fi or Bluetooth. Penetration of improved network infrastructure has encouraged consumers to opt for wireless and technologically advanced products. This is mostly for the convenience factor. Smart oven offers its users security, comfortable living, easy usage, and other added features. 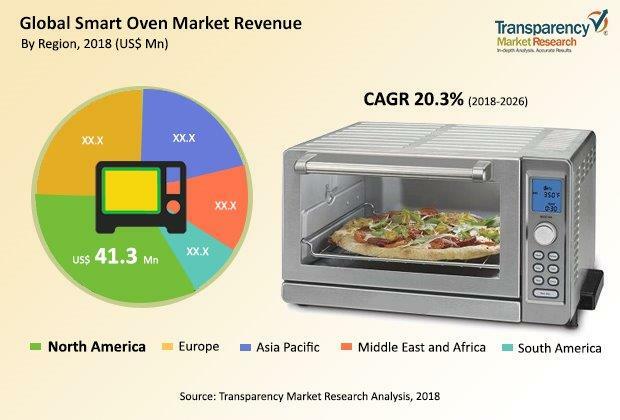 The smart oven market has been segmented on the basis of type, structure type, connectivity, capacity, application, distribution channel, and geography. Based on type, the market has been segmented into single function and multiple function. Based on structure type, the market has been segmented into built-in and counter top. Based on connectivity, the market has been segmented into Bluetooth, WI-Fi, NFC, and others. Based on capacity (liters), the market has been segmented into 20–25, 26–30, and above 30.By application, the smart oven markets classified into residential and commercial. By distribution channel, the market is segmented into online and offline. Geographically, the report classifies the market into North America, Europe, Asia Pacific (APAC), Middle East & Africa (MEA) and South America; the regions are analyzed in terms of value and volume shipments in the smart oven industry. Furthermore, region wise prominent countries covered in the report include the U.S, Canada, Germany, U.K., France, China, India, Japan, GCC, South Africa, and Brazil. The report also includes key developments in the smart oven market. Porter’s Five Force analysis which identifies bargaining power of suppliers, bargaining power of buyers, threat from new entrants, threat from substitutes, and threat from competition is also included in the report. Value chain analysis which shows work flow in the smart oven market and identifies raw material supplier services providers and distribution channels of this industry is also covered in the report. Segment trends and regional trends have also been provided. It also covers segment wise incremental opportunity analysis and market positioning of key players for all regions covered in the scope of study. Incremental opportunity analysis identifies and compares attractiveness of segments based on CAGR and market share index across North America, Europe, Asia Pacific, Middle East & Africa, and South America. The same has also been provided for each segment i.e. by type, structure type, connectivity, capacity, application, and distribution channel. The report also includes competition landscape which include competition matrix, market share analysis of major players in the global smart oven industry based on their 2017 revenues, and profiles of major players. Competition matrix benchmarks leading players on the basis of their capabilities and potential to grow. Factors including market position, offerings, and R&D focus are attributed to a company’s capabilities. Factors including top line growth, market share, segment growth, infrastructure facilities, and future outlook are attributed to a company’s potential to grow. This section also identifies and includes various recent developments of the leading players of the smart oven industry. Company profiling includes company overview, major business strategies adopted, and key developments. Companies profiled in the global smart oven market include GE Appliances, Breville Group Limited, Electrolux, Samsung, Candy Hoover Group S.r.l., BSH Home Appliances Corporation, Dacor, Inc., Haier Inc., LG Electronics, Tovala, and Sub-ZeroGroup, Inc.